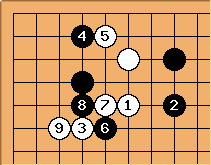 BruGo is an online joseki dictionary and collection of go tools. The dictionary can be used as an index to Sensei's Library. Most sequences have a direct link to the matching SL Joseki page. These links are available with tiny "SL" images underneath the sequence diagrams. Next to the classic navigation tools BruGo's joseki dictionary displays sequence diagrams. The content is mostly based on occurence in professional games. Missing variations can be added by visitors. It's also possible to enable professional moves (There's a collection of about 3 million professional go positions.). Possibility to add moves/sequences (confirmation by administrators required). Listings of recently added joseki, hamete (overplays). A listing of joseki ordered by rank/difficulty. > 3,000,000 professional go positions. Besides offering classic joseki. These are some of the sequences you will probably not find in any other book or dictionary. Usually black answers by jumping out to . But what if black jumps out from the other side? 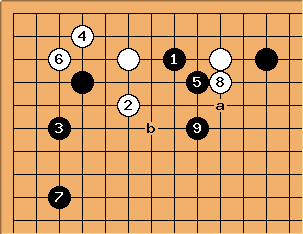 This sequence is often seen in modern Korean games. The sequence comes to an end after a and b.